Marie Granmar and Charles Sacilotto literally live in a bubble, insulated from the cold and the harshness of the elements, while taking in the best of what nature has to offer. 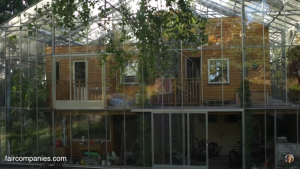 Their house is built inside of a greenhouse, providing them free heat and free food in the winter. In Stockholm, Sweden, where winter lasts 9 months out of the year, that’s a huge asset. The average temperature in Stockholm in January is below freezing. But step into Marie and Charles’ bubbled-in “backyard,” and you’ll be much warmer. A normal family in Stockholm switches on their heater on sometime around mid-September, and doesn’t turn it off again until mid-May or so, Marie says. 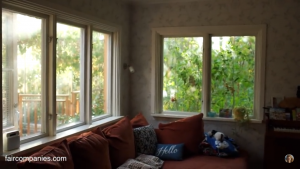 The greenhouse allows them to reduce the number of months they need to heat their home from 9 to 6 months per year, and reduces the amount of energy they use doing so. Any supplemental heat they need, that is not provided by the sun, is provided by a wood-burning stove. Marie says she is more or less immune to the winter blues many of her friends experience during cold weather. Rain or snow, she can sit out on her balcony or her roof-top terrace and gaze at the stars, or any glimpses of sun she can catch. 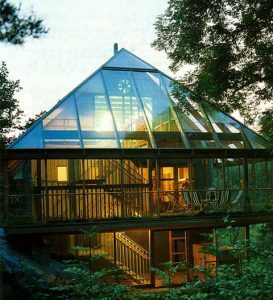 Then, during the warmest parts of the summer, her glass roof automatically opens up when it hits a certain temperature, to let the heat out so it doesn’t get too hot. The family’s favorite hangout is the rooftop deck. 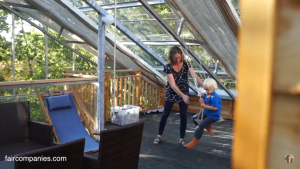 Since they built a glass ceiling, they no longer needed a roof, so they removed it to create a large space for sunbathing, reading, gardening or playing with their son on swings and bikes. 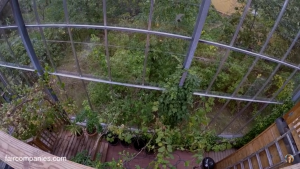 In addition to keeping their bodies warmer, the greenhouse also keeps their plants warmer. 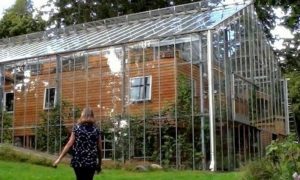 The footprint of the greenhouse is nearly double that of the home, leaving plenty of room for a wrap-around garden. 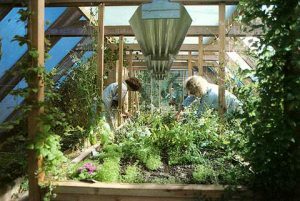 And since they’ve created a Mediterranean climate for themselves, the couple grows produce that typically isn’t grown in Sweden, like figs, grapes, tomatoes, cucumbers and herbs. Outside the glass they have cherry and apple trees. 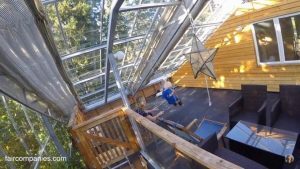 On top of free heat, the couple has also installed a rainwater collection system for free water, and a composting toilet system that provides free fertilizer for their plants. Also, the plants that thrive in their home return the favor by cleaning the air and providing more oxygen. It starts with a urine-separating toilet and uses centrifuges, cisterns, ponds and garden beds to filter waste water and compost the remains. 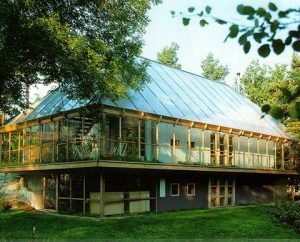 For the future, the couple is working on designing a system to capture excess solar energy during the summer and store it for the winter. 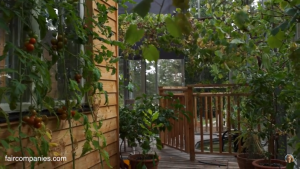 “If you want to be self sufficient, and not dependent on bigger systems, you can have this and live anywhere you like,” Marie said. “It’s all a philosophy of life, to use nature, sun and water to live in a another world,” Charles said. Since then a handful of others have been built in Sweden and Germany.